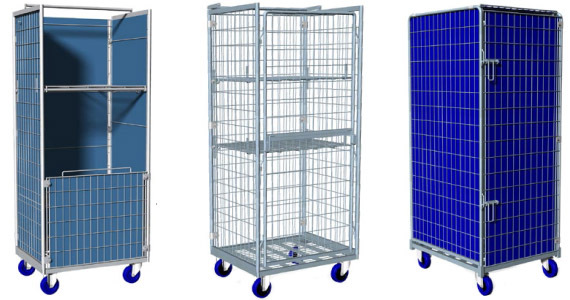 We plan and manufacture wire trolleys and containers suitable for truck transportation, material handling, warehousing and goods display. To date, we have a 30 people staff and a constantly growing turnover thanks to our business which addresses to both Italian and foreign markets. We were born in Predappio, in the province of Forlì-Cesena, as a small handicraft firm and for over 30 years we have been designing and manufacturing wire trolleys and containers suitable for solving problems related to truck transportation, material handling, warehousing and goods display. We firstly addressed to poultry market but then we specialized in many other branches such as small and large distribution, frozen foods, meat processing, industrial laundries and logistics industry, specially focusing on the concept of Material Handling, aiming to obtain a lean production within factories. With a 30 people staff and a constantly more than 30% growing both Italian and foreign turnover, we manufacture, thanks to our technologies and competences, both standard and customized products, specially designed according to our customers specific needs. Our items are indeed selected with confidence by our clients; they choose them thanks to safety and quality of our materials, certified by advanced technologies and the robotized machineries employment, aiming to obtain innovative products, specific for each client typology. Our optimism, dynamism and a constant seeking for new markets and clients, have always brought us to maintain an ideal price / quality ratio for our products; this attitude aims to offer our customers a certain benefit with respect to standards, in order to satisfy even the most specific requirements. Talking to our customers, daily facing our items employers, asking advices and identifying their level of satisfaction, enable us to focus on small criticisms, which are essential to improve offered products quality. The values, which we have always stood out for, are humility and ambition to do our best. Thanks to this way to see the future, our company looks forward and strives after important goals, but always remaining firmly attached to our roots and traditions of great Italian craftsmanship. We have always thought the essential key for success was constantly looking for new products. For this reason, we have embarked on the path of quality and reliability, both for materials and human resources; as well as we have asked advanced technology and our skilled technicians to set and develop our products to better fit both market and customers demand. In the end, functionality, versatility and endurance of our products have been all essential features, which enabled us to be appreciated by customers over time.